Lensrentals has released its most rented gear of 2017 list, and the results are very interesting. You can check out the full list here, but we thought we’d point out the three things that immediately caught our eye. 2. That said, Sony’s top renting piece of gear—the Sony a7S II—only reached the number five spot behind four Canon products; the Canon 24-70mm F2.8L II, Canon 70-200 F2.8L IS II, Canon EOS 5D Mark III, and Canon EOS 5D Mark IV took the numbers one, two, three, and four spots, respectively. Canon may not have released anything overly exciting this year, but there’s no doubt it’s still the best-selling camera brand in the world. 3. Finally, the last bit that caught our eye is that a battery—Sony’s NP-FW50, which was recently replaced the the NP-FZ100 that our own Richard Butler loves so much—took the number 6 spot, beating out some seriously popular gear like the Canon 50mm F1.2L and Canon 6D. This just foes to show: upgrading the Sony a9 and a7RIII to the much bigger FZ100 battery was an absolute necessity. 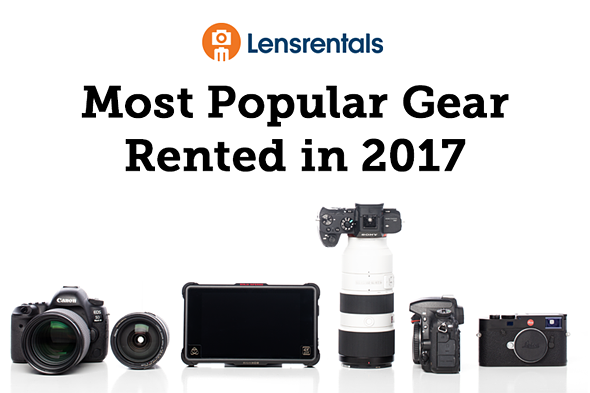 To see the full list and breakdown, or dive into a few other categories like last year’s most-rented list or the most popular new equipment rented in 2017, head over to the Lensrentals blog.